I've played about every iron known to man. 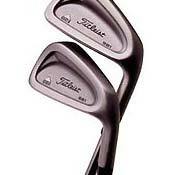 The TITLEIST DCI 981 are the best. The feel of these irons are superb. I have gained a club in distance using this set with Tri-spec stiff shafts.I really do prefer the 981 they are very forgiving and accurate.I also have a set of dci 762 which are a great set but I prefer the 981. Great club for intermediate golfers. I was hitting the 845's from tommy armour before i got me a set of DCI's. I have to say that they are about a club and a half longer then my 845's were. They are long and straight. 5-iron is around 195-205 yrds. Takes some time to get used to stiff staff but only takes a few times at the range. Even after not playing for a few months...my iron play is usually pretty consistant(putting is always a different story). Overall very happy with these clubs and would highly recomend them to someone who plays for power and does not try to manipulate flight patterns. simple hit it straight. i am however thinking about hitting a mid blade...the DCI 962b's any feedback for me?? I just recieved these clubs used from my uncle last summer. I hit them all a little at the end of the summer, and I liked the feel of them. I have steel shafts, but when you do not hit it solid it can sting a little. Overall they are good clubs, at least good enough for a 13 year old. Titleist DCI 981: I bought an excellent condition used 3iron to Lob Wedge with Aldila X-stiff shafts. E-bay purchase from private seller. Eleven clubs, price $150 shipped. I've taken them out on my home course 3 times. Honestly, These are too much club for me. They are heavy. They require a stronger & faster swing than mine to really crush the ball. I'm smacking the 3iron 215 yards on pure hits. Ball contact noise is a really professional sounding "Thwack"! But the shaft vibration on mis-hits is a punishing shockwave snap rips thru the wrists-forearms up to the shoulders. Boy! That teaches me to keep my head still during the swing & concentrate on the ball. Club construction & materials are top notch. I've owned Pings, Clevelands, Mizunos, Golden Bears, Orlimars, etc... These clubs look & feel professional. And I think that you need to be a scratch golfer to enjoy playing with them. Purchased on E-bay. What customer service? Oh, I went thru 11 drivers & 4 sets of clubs last year while seeking golf nirvana. I bought these Irons in 1999 for $599 @Washington Golf in D.C.. To this day, i cannot get myself to leave these irons, they play so straight and the craftsmenship is top notch. The distance and accuracy is amazing. I would have never thought back then id still be playing the same irons nearly a decade later. All the changes in technology still dont merit the success ive had with these clubs. They haven't died yet, the shafts are stiff, i had them fitted by Titleist upon purchase, some lie angles were adjusted in 2000. These clubs probably have at least another 3 years of service, then again, they could surprise me and go longer, who knows. Ive looked around at other brands, but these are working great, and after traveling the world with them in the military and playing some great courses; just to much history to leave them behind now, they still play like they did when i bought them. DCI990, TM Burner models, Forged Mizuno and Cobra irons. hi well, I want to give you guys the honest to god truth. I am 12 years old and I've been golfing seriously for about three years now and one day me and my grandma went golfing. I was currently using a Wilson prostaff oversize set of irons. Once I saw these beauties in my grandma's bag I asked to see them she said that they were lens clubs and she didnt know how to swing them I asked to try them for a little while. That night I went home to the field and took out the 9 with stiff graphite shaft I hit the ball and went dead straight in between the soccer posts I aim for about 140 yards away I was surprised I took another ball and the pitching wedge , BINGO I hit pretty much on the goal line right in between the goal posts I soon hit another one pretty close , again and again I did it I was amazed I ended up getting them from my grandma later on. Bottom line as long as you have the right shafts I would recomend these to anyone P.S I'm not kidding i hit my PW 140 yards! had these irons for about 3 months now,not too lite not too heavy feel well balanced,not as forgiving as some,kepts you to concentrate on makeing a good swing through the ball.have had some nice rounds in the low 80's so far with them.you got a decent swing give them a try. use taylor made r7s for a couple of rounds and lost 15/30 yards depending on club selected.